Things appeared to be going along very well for the hedge fund industry. A recent eVestment study, highlighted at our Ei3 and European Manager conferences, illustrated a level of implied demand from US public pensions, relative returns had been decent in most areas, and a rise in market volatility seemed to be an opportunity for products to define their value proposition. While evidence of consolidation was plentiful, and pockets of underperformance existed, the mood had been positive. When volatility spiked in February, and managed futures products produced a month of returns which had not been seen in time spans rarely used for comparative analysis any more, it made sense there would be a reaction. Understanding liquidity terms restrict short-term evidence of sentiment, it was not surprising that managed futures led the industry into net redemptions in March. Underneath the headline outflow, however, many of the positive themes persist. Investors redeemed an estimated net $9.45 billion from hedge funds in March. Q1 inflows of $14.33 billion are the highest quarterly inflow since Q2 2015. Elevated managed futures outflows reflected the gravity of recent performance losses. Macro flows shifted negative in March, but underlying metrics remain positive. Equity inflows resumed, though continue to be relatively highly concentrated. Investor flows accounted for a net redemption of an estimated $9.45 billion from hedge funds in March. The bulk of outflows were linked to segments which experienced elevated losses in February. Allocations in Q1 2018 remained positive at $14.33 billion, the largest quarterly inflow since Q2 2015. Redemptions were more widespread than average, but also concentrated in March. While the majority of reporting managers faced redemptions in March (54%), the primary reason for aggregate net outflows during the month was because of an elevated proportion of redemptions concentrated within a small proportion of products. What does this mean? The aggregate net outflow during March was not an overwhelmingly negative event, rather a concentrated negative event. Managed futures managers faced the consequences of historic performance declines. Investor sentiment toward managed futures strategies had been defying the gravity of recent returns. In the twelve month span ending February 2018, an estimated $11 billion flowed into the universe, despite performance losses in the prior six month period. While there had been some pauses within this one year allocation window, it wasn’t until February 2018’s historic performance losses that investors reacted in a proportional way. The level of redemptions seen in March is on par with some months in 2013/2014, when the segment was facing elevated outflows after poor returns in 2012/2013. Macro funds hit by redemptions, but they were not widespread. Macro hedge funds began 2018 how they began 2017, with a surge of investor interest. While that interest remained for most of 2017 (through August), it did fade into the end of the year after losses emerged in Q2. 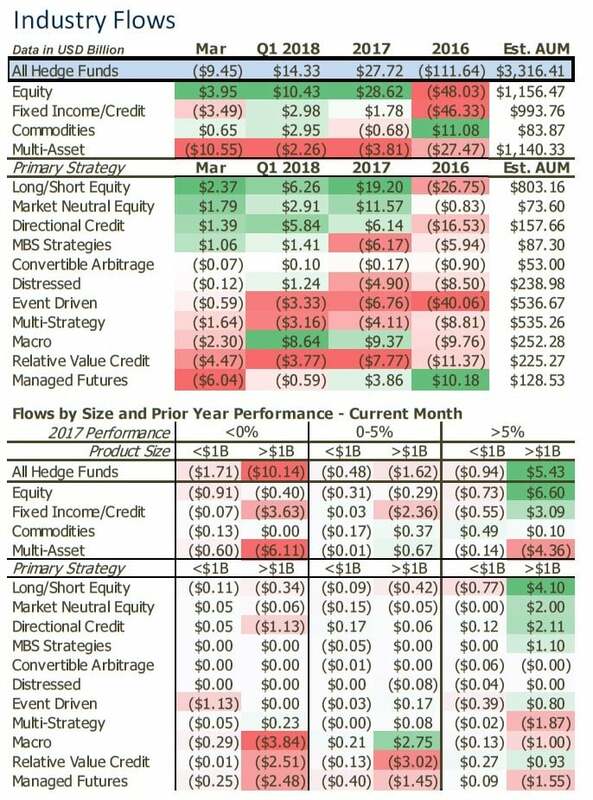 While losses have emerged in 2018 for some, the resulting dynamic of flows is different than what we saw at the end of 2017. Specifically, redemptions in March were highly concentrated. Despite a net outflow, still the majority of managers had more money come in than leave in March (53% with net inflows). That’s a far better proportion than long/short equity managers, who have taken in the second largest inflows this year, and who saw net inflows in the month. There was a hiccup in credit fund flows in March which was also a concentrated event. 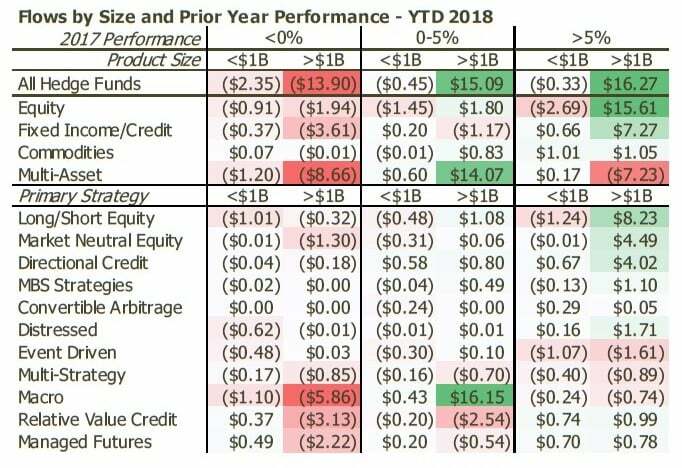 Credit strategies have been on a decent run. After a nine-month string of difficult months performance-wise ended in February 2016, the group strung together almost two years of consecutive performance gains, and money had been trickling back in. The elevated redemptions seen in March were, like macro, concentrated within a few managers. Only 43% of reporting credit managers had redemptions in March, and among those with the largest redemptions, their 2017 returns were well below average. Equity inflows return to an elevated level. Both long/short and market neutral equity fund flows were firmly positive in March, but unlike macro and credit, the majority of managers are not feeling the positivity. Nearly 55% of reporting managers had redemptions in March, and nearly 60% have had net outflows in YTD. Even though EM funds had net outflows in March, their underlying health is far better than that number suggests. Let’s be clear, it has not been an overwhelmingly positive start, distribution-of-flow-wise, for EM strategies in 2018. Yes, prior to March, net flow was positive, but fewer than 50% of managers were benefitting, and flows were mostly targeted to fixed income exposures over equity. In March, a bit of the reverse occurred. Redemptions were very targeted, in fact 60% of reporting managers had net inflows in March, and despite fixed income strategies being among those with the highest allocations, there was a peppering of equity funds as well. 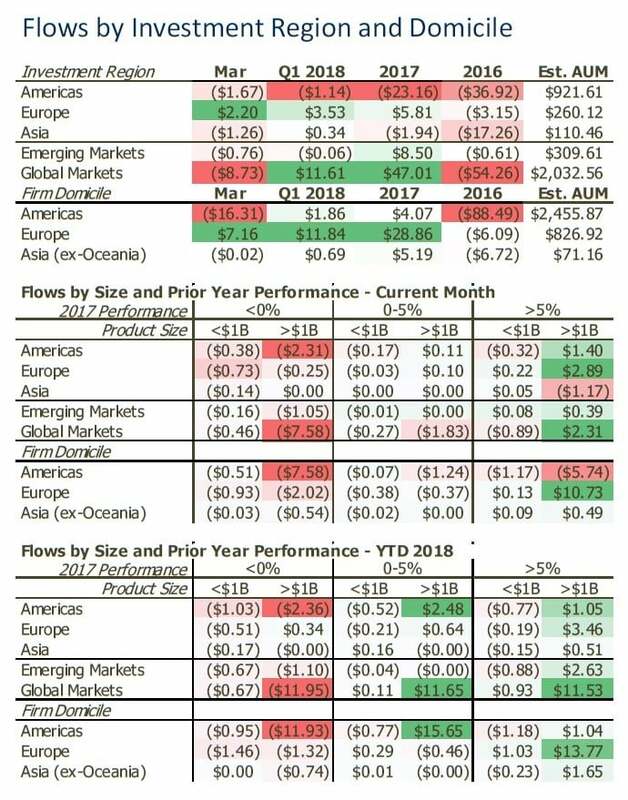 In short, March was an anomaly among recent trends for EM hedge fund flows, and when digging down to the product level, the picture was not bad for EM during the month. Inflows to Europe-based equity, fixed income and macro managers far offsetting mixed flows from managed futures segment. Why are European managers seeing elevated inflows? One piece of evidence to consider is that the ten reporting managers with the largest new allocations in 2018 returned an average of near 12% in 2017. That’s 300bps higher than the industry average, and it includes a diverse strategy mix (so comparison is apples/apples). While likely not the sole reason, it definitely helps.